The Blue Room | Just Shooting Memories! What is your favorite place to take photos? I am still up in the air. I always seem o go for the big landscapes or vast distance photos. However, I have begun working on some close-ups. Does anyone have suggestion on a photographic style they would like to see me attempt? I could then write a post outlining my trials and tribulations. Click the “leave comments” link at the top of this post. 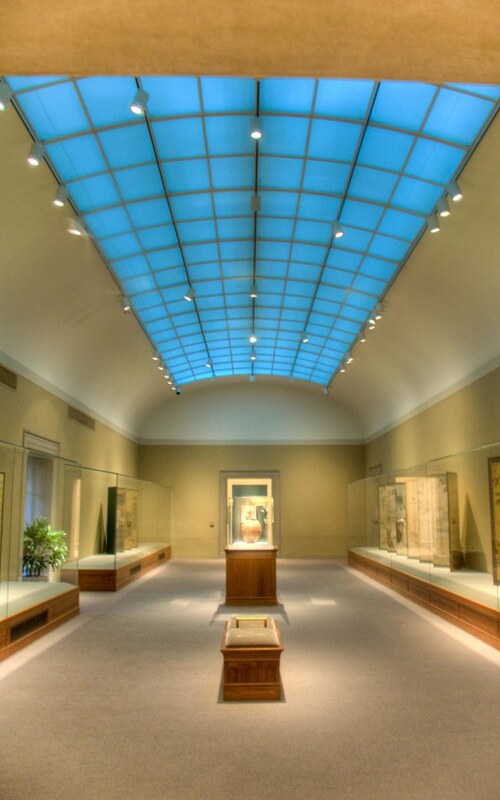 This is one of the exhibit halls in the Museum of Asian History in Washington D.C. I just loved the blue along the ceiling. I don’t know if this is a skylight or just a back lit light. But, however it is done, it is cool. The only things lit well were the actual exhibits, the galleries themselves were very dim. This was handheld, 3 exposures. To get the shutter speed where I could hold it, I had to crank up the ISO. Daryl, I encourage you to take a short trip to the Boothe Museum of Western Art in Cartersville. Our Blue Ridge photo club organized a trip there when the Ansel Adams prints were on display for some thirty days or so. I could not the believe the “little” town of Cartersville had such a large and sophisticated museum of bronzes, paintings and miscellaneous art media. All were of a Western theme (cowboys and Indians, if you will). For $40.00 per year you can become a member and receive free admission and an interesting monthly newsletter. They also have a photo club, if you live close enough to enjoy their regular meetings. They do NOT allow the use of tripods(monopods are OK, though). Barrett, I will definitely have to check that one out. And the plus, it is not too far from home. I Have seen the building and knew it was there, but have never thought of it. I guess I should try for some more places close to home. Love your style, not too much, not over the edge, subtle. I like to do it this way as well. I invite left, would love to enter the HDR Spotting arena. Lucien, thank you. The interesting thing is that I used to do the “over the edge” stuff, but have toned it down considerably. I sent an HDR spotting invite via twitter. I enjoyed your work posted on Flickr and think you are doing well.